Publisher: Phaidon Press Limited: London, England. The history of ceramic art is ingrained in the history of mankind. Clay is one of the very first materials 'invented' by man. An essential part of our lives it has been moulded, thrown, glazed, decorated and fired for over 30,000 years in order to preserve and transport food and water. In more recent times clay has been used not just by artisans and potters, but also by artists, designers and architects. 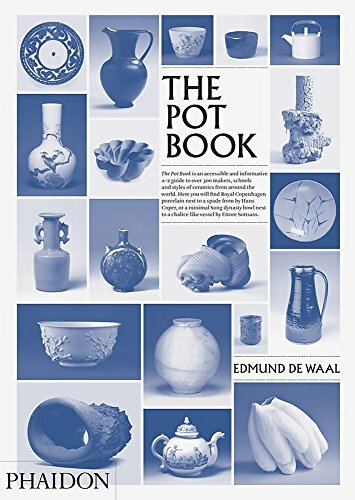 <br /><br /><i>The Pot Book</i> is the first publication to document the extraordinary range and variety of ceramic vessels of all periods, in a comprehensive and accessible A to Z format. From a delicate bowl made by an unnamed artisan in China in the third millennium BC, or a jug made in eighteenth-century Dresden, to a plate made by Picasso in 1952, a 'spade form' made by Hans Coper or the vases of Grayson Perry today, it's all in included in this beautifully illustrated collection. Each entry is sequenced in alphabetical order by the name of the artist/potter, the school, or style, creating a grand tour through the very finest examples of the art form. Edmund de Waal apprenticed as a potter in Canterbury, before studying in Japan and Cambridge. Today his porcelain is in thirty international museum collections: most recently he has created major installations for the V&amp;A and Tate Britain. In June 2010, his memoir, <i>The Hare with Amber Eyes</i> won the Costa Biography Award and New Writer of the Year at the Galaxy Book Awards.